Well, we are already off to a slushy start to the day. At least, we are up East. Due to heavy rains that swamped New York on Friday, two of the top Graded Stakes events — the Waya & the Lure — have been cancelled for today and moved to next weekend. But..(There’s always a “but,” right? )…we still have a number of races all over the country to handicap, debate, bet, and Win. 5th: 1-5-8-7-4-3-9…De La Rose Stakes…This is the only grass race on the card today, after the torrential rains, and the course will definitely be labelled “soft” for this event. So, take that into account when you are trying to separate your top picks. I did for mine, even though I had a strong predisposition to go with Uni (1) in this spot any way. In fact, I love this 4YO daughter of More Than Ready, who is a Brit-bred daughter of Unaided. She formerly ran over n Europe, when it was normal to find a track of this nature. Won a handicap event over a soft foot of ground in France last year, and has been lights out since coming to the States and hooking up withe the expert grass trainer Chad Brown. Won the Plenty of Grace Stakes last time out in the 2018 debut, and did that from a nice stalking position. Was a little closer to the pace in that one than normal, but should be able to care out a nice trip from the rail today. Has come back from that April win to work well, and this one is plenty good enough to handle this group. My Best Bet of the Day, and a single for me. The filly that may give the top pick the most issues in here could be a stablemate, in Precieuse (5), who will be making both her 2018 and N.A. debut for the Brown barn. She won a Group 1 in France last May (as in 2017), and that was over soft ground, as well. She has been training very well for this return and the barn hits with .22% of those making the U.S. debut, and with .29% of those coming off this type of a layup. Contender. Bletchley (10) is one that could spice up the exotics a bit, if she can contend. She comes out of the G2 Dance Smartly, where she ran a troubled fourth. Before that had a nice run in the G2 Nassau. She is a dead closer who will need some racing room late, but she picks up a HOF rider for the first time since they hooked up to win together in March of this year. Like the 10-1 ML odds. Watch out. I bet the 1 to win/place/show and then key the 1 over/under all the numbers. I go more with the 5-8-7, and less over the 4-3-9. 6th: 1-5-3-8-2-4-6…This is a race that I will focus much of my attention and betting bankroll on the top two numbers, and, once again, lead with the rail horse, Alkhaatam (1). This is another one that hails from the barn of Chad Brown, and he, too, will be making his 2018 debut. This well-bred son of Tapit, though, nearly won on debut back in October and then ran a trouble fourth in the G2 Remsen as a maiden. Has been off since, but I love the recent workout schedule and the bullet move here on July 21. Looks to be primed and ready to go and picks up a top rider in Jose Ortiz. Business Cycle (5) is, yet another, from the barn of Brown, as well. This 5YO son of Curlin is still a maiden, though, and has just one race in his career — a second last November at Aqueduct. The fact that Brown and his owners are still fooling with this one, though, gives some indication that they love his talent, if not his health. Love the work this one had, in company, with the top pick. Any looks like he is primed for a top run today, as well. Dark N Cloudy (3) ran third on debut at Gulfstream Park in late June. Not too many good ones left in Florida at this time of year, and he ran a disappointing and a fading third. But his works have been better since moving out of the heat and rain, and I like the move here on July 30. Trainer does very well with second career start (.30%), and with beaten favorites (.26%), which this one qualifies for, as well. Should run better today, and like the 6-1 ML odds. I bet the 1 to win/place/show and then key the 1 over/under the rest. More with the 5-3-8. Less with the 2-4-6. 7th: 6-3-1-5-4-2-7-9…I will key on the top 3 numbers in this sequence, led by Mucho (6) — who is a tidy 12-1 odds in the ML. This 2YO son of Blame (who is having an excellent year) ran a nice second on debut at Belmont Park in June for a trainer not known for cranking them up for a first start. Has since returned to train very well in the a.m., and love the work here on July 30. Should get better with added distance, which he gets an extra 1/2-furlong today. My Upset Special of the Day. Cousin Pete (3) is a first time starter from the barn of Todd Pletcher, who does hit with .23% of those on debut. This one cost $320,000 at a 2YO sale earlier this year, and has been training very well for the first start. Trainer is having a solid meet here — again — with a 7-5-3 record in the first 31 starts. Look out. Fullness of Time (1) is my Brown horse this race. (Have to have one, you know.) Another first time starter, and this one cost a tidy sum of $270,000 as a Keeneland September Yearling last year. The breeding suggests that he may want more distance of ground, to me. But the work on July 16 here was so good that I can’t leave completely out even at this sprint. I bet the 6-3 across the board and then box the top 3 in the exacta. I key the top 3 over the rest in a smaller version. 8th: 7-6-4-8-5-2-3-9…G1 Test Stakes…Try as I might, and hope as I may, I can’t get away from picking Mia Mischief (7) in this spot today. She has an easy, run-away win over the slop — back at Keeneland last October. She never was worse than second in the first 7 races of her career. She has speed to burn, and I just got to think that the last race was a toss out, coming off an extended layup. Trainer hits with .26% of those returning as a beaten favorite, and this one has trained well for this major event. I have to think she returns to form in this spot today, and she does have a win and a second at the 7 furlong distance. Separationofpowers (6) figures — on paper — to be the toughest competition, as well. She ran in the same race as the top choice last time out and neither put in a top performance, but it was the 2018 debut for this one. She closed very well from 12 lengths out of it to be beaten less than 2. Needs to stay a little closer today, and figures to do so. Broke her maiden over this track by 11 last year. Should be tougher today, as well. Classy Act (4) out-ran both of the top two picks in the last race, and is in top form right now, and she loves this distance. Another daughter of Into Mischief and if you throw out the stretch out in the KY Oaks, she has been right there against some of the best. Should be stalking the lead today, as well, and can’t fully dismiss her chances, for sure. Minit to Stardom (8) is a filly that I love, and I believe she has great upside. Faces the “Big Girls” for the first time today, and that step up is a big challenge. I will definitely use this one in the mix, as well. I bet the 7-8 across the board and then box the top two numbers with the 8 in the exacta. I will key the top 4 over the rest in a smaller version. 9th: 2-7-1-4-8-6…G1 Whitney Stakes…Backyard Heaven (2) was, without a doubt, a disappointment in the G1 Stephen Foster Handicap at Churchill Downs on June 16, and in his last start. After winning the three previous races, I really thought the son of Tizway would and should be a tough out in that 11/8-mile event. He spit the bit early in that one, though, and left the real running to Pavel an Honorable Duty — two good ones, for sure. Now, he is back for trainer Chad Brown and looking to make amends. And, I think he will. He is training nicely over this track, dating back to July 21 move. And, nothing in his past indicates that he is not capable of firing a big number again today. I loved his run in the G2 Alysheba Stakes at Churchill Downs on KY Oaks Day. And, I think if he can duplicate that run, again, he will be a tough beat. Love the 9-2 ML odds, as well. My second Best Bet of the Day. Good Samaritan (7) is one that could spice up the betting rack a bit, too. He is 12-1 ML odds for trainer Bill Mott, and he returns to the same venue where he won his first ever try over the dirt surface — winning the Jim Dandy Stakes here last summer. Since then, he has won only one race — the G2 New Orleans Handicap at the Fair Grounds in late March. But…I think he has excuses in the each of the last 2. I think the G1 Met Mile was simply too short for him, and included some really nice runners. The Alysheba, he ran up against our top pick. He will be running late today, and will need a car run, but I think he has the ability and the track that he likes. Tapwrit (1) — winner of the 2017 Belmont Stakes — has not really been close in the three races since his G1 victory. But I think he may be ready to fire another good one today, closing from off the pace. He looks a bit sharper in the a.m. — especially with the work on July 21. And, it will be the third try off a layup, when the trainer hits with .25%. Son of Tapit has won over $1.2 million. Could add to the bankroll today at a price. Mind Your Biscuits (4) and Diversify (6) — are both NY-breds and both of the favorites. I think the former has the best shot of hitting the board today, but I really question whether he wants this type of distance. I think both are very vulnerable. I bet the 2 to win/place/show and then key the 2 over/under all the numbers listed. I do so more “On Top,” and I will use with the 7-1-4 more than the 8-6. 1st: 8-2-4-1-3-6-7-9…I will concentrate on the top 2 numbers in this sequence, led by Fortnite Dance (8). This one nearly won on debut for trainer Peter Miller (who is 11-4-2 in 41 mounts so far this meet) here on July 21. Got tired in that one after setting the early fractions of :21.4, :46.1. With a little better pace judgment from the apprentice jockey today, this son of Liaison could be tough to catch. Trainer hits with .14% of those racing for the second time, and with .14% of those getting the shades for the first time ever. Although I wonder why this speedball may need blinkers? If the debut run helps with conditioning at all, this one could be a runner. Its Gonna Hurt (2) is another one who sprinted right with the top choice last time out. The speed duel killed both of them. Perhaps the jockeys will figure out a better strategy this time? This one was bet down to favoritism in that event, and the trainer hits with .39% of those kind returning. Like the 5-1 odds here. Oil Can Knight (4) is a 10-1 ML shot that could add some value to the mix. First timer for Doug O’Neill, who start out blazing hot here. Dam has five winners from five starters, and this one gets the barn’s No. 1 rider. I bet the 8-2 across the board and then box the top 3 in the exacta. 4th: 2-5-6-1-4…Graduation Stakes for Cal Breds…This is a Stakes event restricted to only those that meet the criteria for a registered California-bred horse. But the field for 2YOs is quite interesting, led by Luck’s Royal Flush (2). This son of Lucky Pulpit (the same sire of California Chrome) is a speedy type who has not been worse than second since trainer Jeff Bonde added the blinkers three starts back. Has won the last two in a row in impressive fashion, including a Stakes upstate . HOF rider Gary Stevens gets back in the saddle for this one, and they should be tough to catch. Love the work here on July 28. My pick. Our Silver Oak (5) is the 2-1 favorite in the ML, and comes out of a nice MSW win at Los Alamitos in the last start. Closed well from off the pace that day and may have the perfect running style for this one. Beware. Carnivorous (6) is 12-1 ML odds for the O’Neill barn and could spice up the exotics. I bet the 2-6 across the board and then box the top 3 in the exacta. I key the top 3 over the rest in a smaller version. 5th: 3-1-6-5-7…Royal Descendent (3) is the 2-1 ML favorite, and I can understand why. This one ran second on debut at Santa Anita on June 1, but was wide and troubled in that event. Trainer hits with .31% of those returning for the second career race, and with .24% of those getting blinkers for the first time. And, this one will get them today. Like the work pattern, and he looks ready to graduate. I bet the 3 to win/place and then key over/under the rest of the numbers listed. 7th: 8-3-6-12-2-4-10-7-5…I will key on the top 2 numbers in this list, led by Neptune’s Storm (8). This is a 2YO colt by Stormy Atlantic, and cost $130,000 as a 2YO earlier this year. Will make the afternoon debut today for a trainer that hits with .14% of those types, and is having a super good meet here right now (4-1-2 in 14 starts). The sharp work on July 29 indicates that he is ready, and I love the 6-1 ML odds here. Dark Prince (3) may figure to give this one the most issues. A high-priced son of Cairo Prince is trained by Bob Baffert. Tired in the initial start up at Los Al, and was not overly bet that day. Take a look at the tote board today to see if he garners more action. Love the work here on July 29. I bet the 8 to win/place/show and then key the 8 over/under all the numbers in this way: More with the 3…Less with the 6-12-2… Even Less with the 4-10-7-5. 8th: 7-11-1-8-9-6-5-4-12…G1 Yellow Ribbon Stakes…A wide open affair here in what should turn out to be a great betting race — if you can figure out the winner. I like the top 4 numbers in this one. And, I will try to figure out a winner and exotic play keying those 4. My top pick will be Madame Stripes (7) — who is 8-1 in the ML. 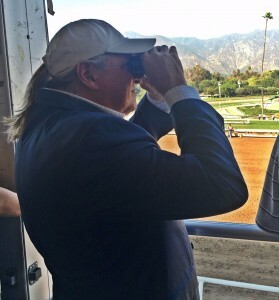 She nearly won the G1 Gamely at Santa Anita back in May (despite being put on the lead that day) and trainer Neil Drysdale is having a super year so far — winning with .21% of his 102 mounts. This one worked ell over this grass course on July 29, and I think the change of riders should lead to a more patient ride. If she stalks this group, she may be ready for a big score. Cambodia (11) ran over this grass last in the G1 Matriarch Stakes here on Nov. 26. Ran fourth that day after running third here in the Breeders’ Cup Fillies and Mare Turf. Certainly has the class to be tough in this spot, including a win here in the G2 John Mabee Stakes last September. Needs to pick it back up, though, and may be a better play underneath. Beau Recall (1) won the G2 Royal Heroine at Santa Anita back in April, but has been fourth in the last two. Nearly won the Del Mar oaks here last August, and is a steady performer with class. I love this filly, and at 8-1 odds, I will definitely use. I bet the 7-1 across the board and then box those two in one exacta. I will key the 7-1 over/under the 1-8 in two more. I will also key the 7-11-1-8 over the rest of the numbers in a much smaller, “cover” exacta, as well. 2nd: 2-1-4-6-5-3…I will focus on the top 3 numbers in this list, led by Smart Emma (2). Trainer doing well here this meet with limited runners, and this one gets a top rider on this circuit today, who specializes on the grass. Tired in the last two, but may get a better race scenario in this spot today. Coco Channel (1) picks up a top rider here, and looks solid in this spot, although she may be better coming off the turf. Has a shot stalking this pace here. Valentine Wish (4) should the best of the closers. I bet the 2 across the board and then box the top three numbers in the exacta. 6th: 3-6-10-11-9-12-1…I will focus on the top two numbers here, led by Our Bay B Ruth (3). This 2YO filly by Candy Ride is a first timer starter who has been training lights out. Trainer hits with .18% of those debuting on the grass. Jockey has hit with .31% of the last 13 rides for this barn. Vortices (6) goes for my good friend Buff Bradley, and gets in today at 6-1 ML odds. She has a big shot making the grass debut after two starts. Love the work pattern for this patient trainer, and looks ready to score at a price. I bet the 3-6 across the board and then box those 2 solidly in the exacta. I key the 3-6 over/under the rest in two smaller versions. 8th: 10-8-6-4-3-7-11…Once agin, I will focus my attention on the top 3 in this sequence. Bridled Temper (10) ships in from Arlington Park to try this spot today. Closer will be dropping out of a Stakes event, too. Love the way she closes, and the daughter of War Front has a true grass pedigree. Stands out to me here. Our Closure (8) is another one who should be closing late. Like the last run over this course. Contender. Soft Cheese (6) is 8-1 ML odds and could add some value. Love the rider — who excels over this grass course. Will be the one to catch on the lead. I bet the 10 to win/place/show and then key the 10 over/under all the numbers listed. I bot the 10-8-6 in a much smaller version to give cover.